I was provided free product from Oriental Trading in exchange for a blog post. No other type of compensation was received. At the bottom of the post are some affiliate links. All ideas and opinions are my own. I asked my daughter what kind of birthday party she wanted and she said Frozen. For those of you who are new here, I threw a Frozen birthday party last year. I was not about to do that again. So I told her that she needed to come up with something else. I was prepared for a complete meltdown, but instead she said, "OK! PRINCESS!" That was when I thought, "Really?" I mean that isn't that far off from Frozen. However, I decided to work with it. This daughter of mine lives, breathes, and sleeps PRINCESS. She always needs a dress on. Just the other day we went to preschool and she gasped in the back seat (almost caused me to have a heart attack) then she said, "We forgot to put a dress on me!" She is always wanting to dance around the room with her prince. She has a certain princess smile. She eats like a princess. She plays with all her princess toys. I mean the list goes on and on. So I thought that a princess party was probably the best option for her anyway. This year she turned four years old. I told her that she could have a friend party this year, but she could only invite four friends. She was happy with that. Then the birthday party planning began. It was so much fun to plan out this party. I can't wait to show you all the details. The first hurtle I had to overcome was what I was going to do for the party favors. I wanted to do something fun. At the same time I wanted to highlight each of the princesses. 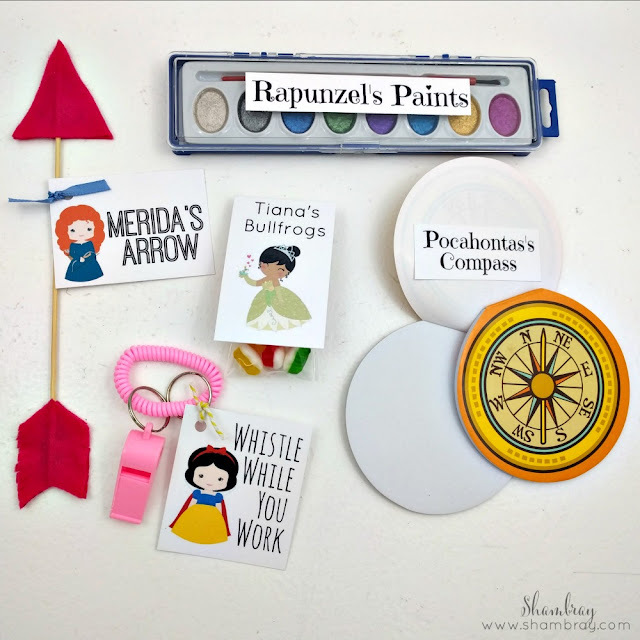 So I thought it would be fun to have a prize or present from each of the princesses. 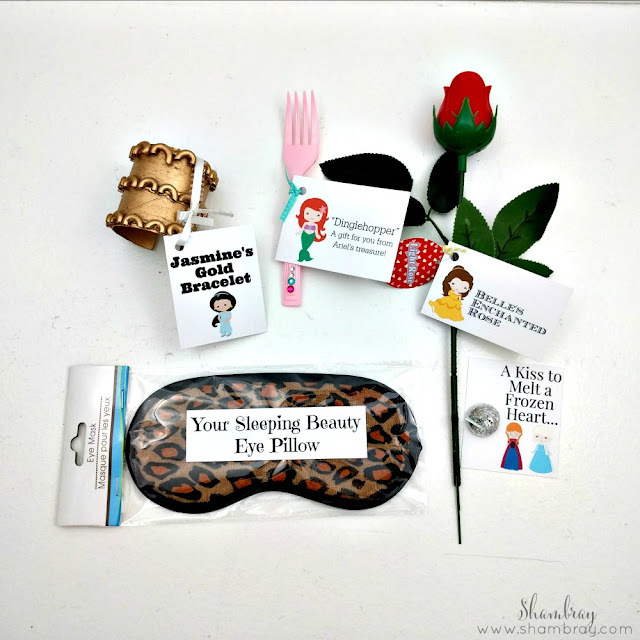 That is when I decided to put together a gift bag with all the princess "treasures". Do you want to see what I came up with?! I have to add that each bag and the contents cost about $3 a piece! So affordable. Ariel (from The Little Mermaid): A dinglehopper made with a plastic fork and some jewels. (All left over from other projects. I attached a little tag to each treasure to make sure the girls knew exactly what it was they were receiving and who the "treasure" was from. 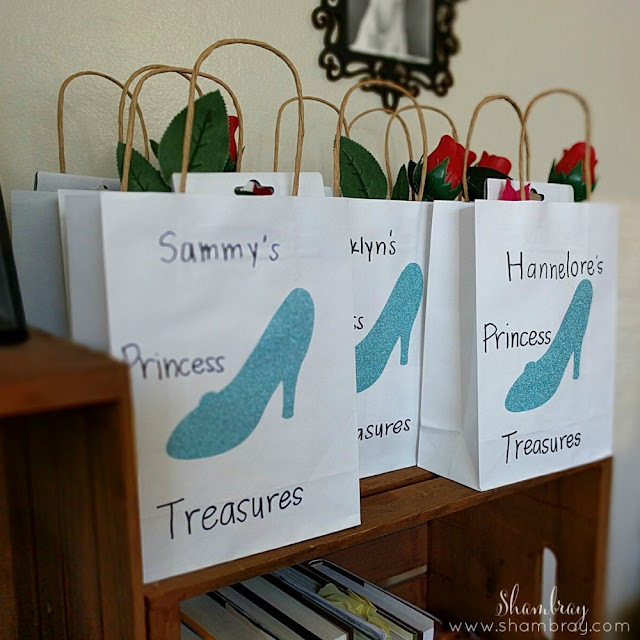 Then I put them in a bag with the cutest glass slipper (for Cinderella of course) on front. Everything fit in the white bag perfectly. 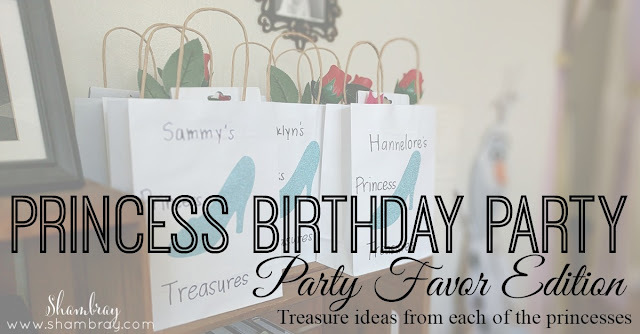 I loved the white bag with the blue glitter of the glass slipper. I cut out glitter iron-on vinyl for the glass slipper using my Cricut. I couldn't have been more thrilled with how it turned out. 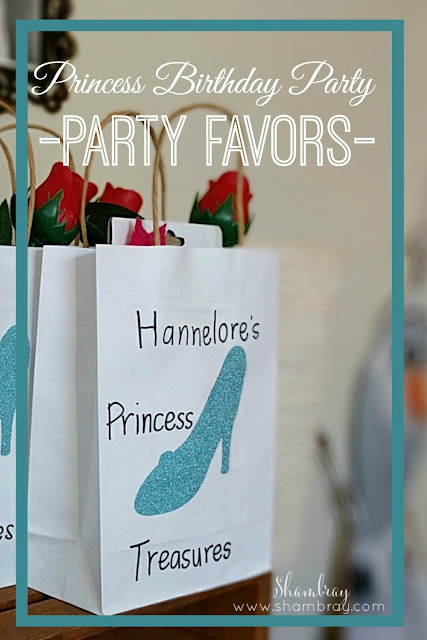 The girls loved their party favors and the smiles on their faces made it worth every thought I put into it.